It’s time for another round of my experience with GTA 5’s newest car! If you haven’t read my first two experiences, you’ll definitely want to check them out. What is GTA 5’s newest car? It is the Progen Itali GT Custom and it is certainly a fast super car! If you read the first part in my series, then you’ll remember when I first purchased the car, went to go upgrade it, how another player destroyed it, and how I was able to get a new one thanks to the in-game insurance company. The second part of the series had me taking my Progen out and testing it on a few of the stunt jumps especially at the airport. The car can definitely get some serious air time from those jumps and flip wildly in the air. It certainly makes it hard to land those stunt jumps successfully. Well now I’m going to take the Progen Itali where no super car (of mine at least) as has been to before. I’m taking it to Mt Chiliad. You can read my story and and check out my entire video of the whole ordeal below. After having driven my newest car around the city a lot, I decide that’s it time to take it outside city limits and go to higher ground. It will certainly be interesting as super cars are generally not made for the off road experience. I start out in my apartment and quickly head down into my garage where I hop into the Progen Itali and head on out. It’s raining outside, but I got some good traction on my car ever since I upgraded it. I head up onto the I-4 freeway and proceed at maximum speed to head out of the city. I love driving on the game’s highways and the views are always spectacular since you are driving through mountainous areas. I drive past some towering wind turbines and continue on past where another major highway merges onto the one that I’m on. I continue on with my drive admiring the scenery especially with the massive Mount Chiliad in the distance but to which I’m quickly approaching. I finally come to my turnoff from the highway and get ready to go where my Progen has never gone before. After the turnoff from the highway I was on, I quickly come upon a trail off the side of the road that quickly ascends off into the distance. This is a trail though that is made for hikers, not cars. Am I nuts for doing this? You bet! This is Grand Theft Auto after all where you are free to do the craziest things! 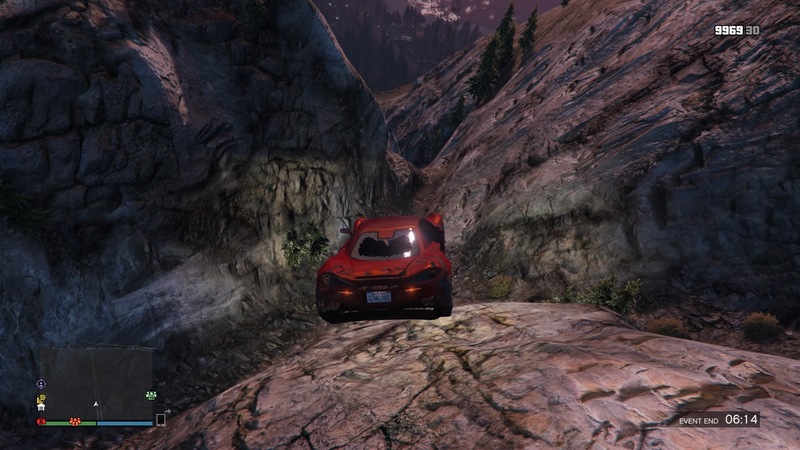 I drive off onto the hiking trail quickly ascending up towards the top of the tallest mountain in the game. The trail initially twists and turns, but then I get to an area where I have to start to be really careful as I can easily go off either side of the trail as I’m getting higher and higher. The Progen Itali GTB Custom seems to actually be doing well going up this trail. I eventually come up to what looks like a big boulder in front of me on the trail, but notice I can actually jump it as it is more of a ramp. I hit the accelerator harder to pick up speed and up I go as soon as I hit the rocky ramp. I hope to have enough speed and air to land on the other side of it back on the trail, but I just don’t quite make it. I land off to the side of the trail, but land initially upside down and then my car flips a few times causing me to panic as I think I’m going to quickly fall off the part of the mountain I’m on. Fortunately I land in an area where my car doesn’t slide down and I’m able to get back upright and drive back onto the trail. There is some damage to my beautiful car, but not enough to where it’s not drive-able. I get back on the trail and continue my climb to the top. After a few minutes of perilous driving on that trail, I finally reach the top of the mountain and manage to get my car up to the lookout area. I stop just a couple of times to get a look at the surroundings and also notice 3 hikers nearby standing at an edge at the top looking at the beautiful sunset and also the ocean in the distance. I get out of my car and head onto the lookout and I’m looking around to see if I can find something specific. There’s a ledge or a walk-off up there in that area where in the single player portion of it, there are dirt bikes at the top and you can get on one and head off the extended ledge falling right on down the side of the mountain. 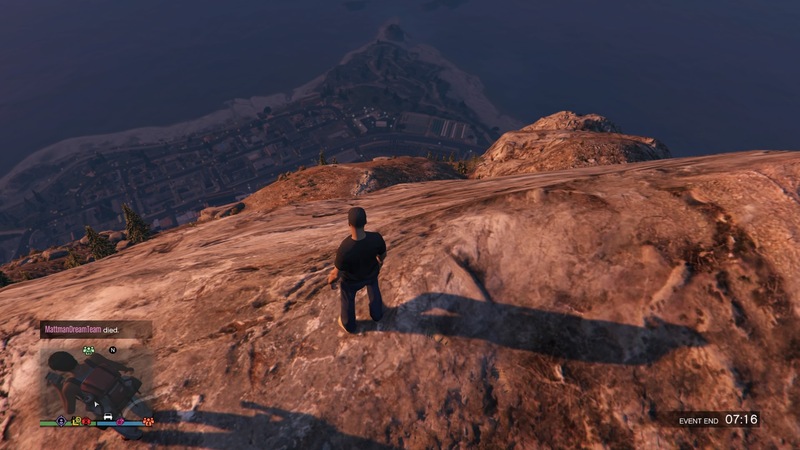 I quickly take my online created character up by the three hikers who are admiring the view and I look down and see a town down below and it is a LONG WAY down there. I quickly see the ledge/walk way and run back up to my car. I start to drive down to that partial walk way and try to pick up speed to fly off of it, but I end up hitting the railing on the side of it and end up falling off the mountain very quickly. I lose control of my car, hitting the side of the mountain flipping constantly up into the air with my car taking massive damage. I keep descending further and further and eventually I lose the passenger side door and soon my driver’s side door as I continuously hit boulders and trees on my fall down to the bottom. My back window and front windshield soon both get busted out. Eventually though I finally make it to the bottom where I do eventually lose the hood of my car as well. How I’m still alive is beyond me, but as severely damaged as my car is, I’m still able to drive it so I drive through the forested area and manage to get on the main highway which thankfully is near the town I saw from up on top of Mount Chiliad. I find a Customs and repair shop in that town and head there to get my mountain damaged car repaired all for a mere $385. I won’t complain at that price especially since I have more than enough money in the game to pay for it. Once that is done, I decide to head back to the city….or do I? Instead of going back to Los Santos, I decide to go to the game’s military base. Once I get to the road that takes me there, I slowly drive up to the main base where a guard is out there pointing a large automatic rifle at me and warning me to turn around. Do I comply? Of course not, I drive right through the rail guard and straight at the guardsmen pointing his weapon at me and manage to knock him down and kill him. I do not get through the main gate however. After what I just did, I got an immediate 4 star wanted level. I knew what was about to happen next so I quickly turned around and headed out of there as fast as I could! After my car is initially shot at by the other guard, I drive up to the main highway and drive towards the city. As soon as I get onto the highway though, there are cops ready and waiting to chase me. There are also helicopters above me chasing me and shooting at me as well. Things are really starting to get dicey! I make into a tunnel, dodging cop cars coming at me, but unfortunately I quickly come up on a roadblock made up of SWAT vehicles which I am unable to initially get past and slam right into one of them. I hit a SWAT personnel who was in front of the vehicle that I crashed into. I quickly get control and manage to squeeze through to the left of the blockade and I’m back off to the races again. As I exit the tunnel and start to cross a bridge, I get shot at again by the helicopters above. Eventually a tire on my car is blown and I start driving on the rim causing sparks to fly. I’m still actually able to maintain control and generally keep up my speed despite losing a tire. I keep on driving, managing to dodge more roadblocks but still taking heavy fire. Eventually it starts to get very hard to control the car and I do spin out a few times. I slam into a semi and then eventually another cop car as I reach the edge of the city limits. I unfortunately do not make it much further as I’m taken out from above. Dang it! I was hoping to make it to the downtown area on the freeway and head into that huge hole in the freeway wall that heads underground so I can lose all the cops. It just didn’t quite happen that way. I managed to re-spawn a short distance from where I was killed on the highway and so I make my way back there to get back into my bullet ridden car. Unfortunately, the cops towed it away and it is at their depot deep inside the city. I want my car back and so I’m trying to decide how I’m going to get to that depot to retrieve it. I saw a large flatbed semi on the highway and decide to take, but I did not see or pay attention to the fact that there was an armored SWAT vehicle right in front of the semi so as I soon as throw the driver out and get in it, I immediately get a wanted level and the sirens start to blare from the SWAT vehicle. Thankfully it is initially a one star wanted level, but it does go up to two. Of course now that I’m driving a large semi, it’s very hard for the cops to stop me especially since I can just plow them out of the way. I get onto the freeway and make it to where I was originally going to so I could get away from the police. After I wait it out, my 2 star wanted level finally disappears and I can now go get my car at the police depot. As soon as I make my way there and get ready to get out of the semi, another player drives up in front of me and briefly stops. I fear the worst and get ready for a shootout, but then he decides to do donuts in front of the semi. He does this for a little bit until another player drives by and he decides to go after him. I breath a sigh of relief and get out of the semi and head to the gate of the depot and try to figure out how I’m going to get my car back without getting the cops chasing after me. My car is still badly damaged from my initial chase with the cops so I’m definitely in no position to make a run from them. Suddenly a message pops up saying that in order retrieve my impounded vehicle I had to pay $250. That’s not bad at all so I pay it and the gate opens up allowing me to finally get my poor Progen Itali GTB Custom. I take my badly damaged car back to the garage at my apartment and call it a day. The good thing though is that my damaged car will automatically be repaired in the garage at no additional charge so I don’t have to take it LS Customs. What a crazy adventure with my Progen wouldn’t you say? I took it up to Mount Chiliad just to go off the side of it but miraculously survive, managed to get it repaired in the nearby town and then go to the military base where I start an incident and get relentlessly chased by law enforcement and get killed. Hopefully you enjoyed part 3 my experience with GTA 5’s newest car. There will definitely be more to come so always check back. In the meantime you can check out the video below of my entire experience. At first, I was like “what, all you did was drive up a mountain…” but then when you bailed down that mountain I was in stitches. Like yeah! this is how to drive in GTA! and I’m still laughing as I speak. Haha, glad you liked it Ryan. Yeah just driving up the mountain means nothing if you don’t go down in it in the craziest way possible. Glad this all brought back memories! You should definitely buy this game, it is just so much fun to play. I really enjoyed reading that. I’m a big gamer, although I’ve never really been into the GTA games. I have played some of the older GTA games but none of the newer ones. I liked them but lost interest pretty fast. I’ve been thinking about checking out GTA 5 recently. I hear great things about it and have been looking for a differnt game to play. The way you described your driving experience there may be the motivation I needed to finally get the game. I really love GTA 5 and is probably one of the best GTA games I’ve never played. The support Rockstar has continued to give to it, mainly its online portion, is nothing short of amazing. There’s so much content and things to do in the online portion that you just can’t get bored of it. It’s definitely worth picking up.